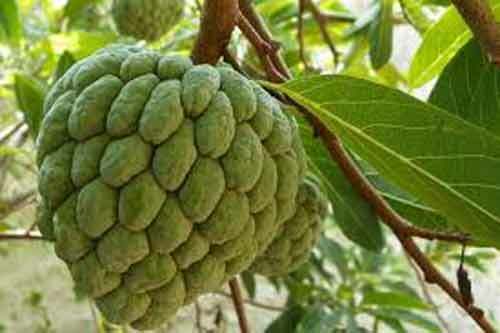 Sitaphal, popularly known as custard apple, is a fruit named after Mata Sita in the Ramayana. The fruit is noted for its high nutritional value. The fruit known as Cherimoya is a native of South America and belongs to the genus Annona. Seeta-phal (fruit of Sita) is not found in the Ramayan but it reached India through the Portuguese in the 17th Century. Sitaphal was recently ranked second among 100 nutritional foods in the world, published by BBC, with a nutritional score of ninety-six. Badam (almond) with a nutritional score of 97 was the ranked one. Sitaphal is rich in sugar (glucose and sucrose) and vitamins A, C, B1, B2 and potassium. The bark and root of the plant is considered medicinal particularly for breathing troubles. Roots have curative properties and can heal old or bad wounds. The leaves yield pleasant smelling oil. The oil is not edible but the oil cake is excellent manure. The plant is an excellent insecticide and pesticide. Spraying custard apple seed oil prevents pest attacks and diseases in paddy and other plants. Seed extract and leaves extract (25 gms in a liter of water) can be sprayed to keep away pests in vegetable gardens. Sitaphal tree is a medium sized evergreen tree and it grows almost all over India. It grows 3 to 5 meters. It is wonderful tree to have if you have a garden.